Haythornthwaite, Philip J. (Editor). 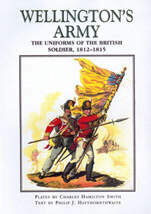 Wellington’s Army: the Uniforms of the British Soldier, 1812 – 1815. Illustrated by Charles Hamilton Smith. London: Greenhill, 2002. ISBN# 1853675016. 60 color plates with accompanying text. $85. Hardcover. prolific artist, who sketched and painted throughout his life. He estimated that his collection included over 38,000 drawings he had made over the years. Most of these were of non-military subjects. However over 1,400 were uniform studies, with another 3,000 containing drawings of soldiers whose uniforms were so accurately depicted that you could see facing and ornamental details! Additionally, he painted numerous schematic illustrations that showed the facing colors, lace, and other distinctions of various regiments. Wellington’s Army is a large book -- 14” X 12” (35 cm X 30 cm) and is in the same format as Greenhill's acclaimed Napoleon’s Elite Cavalry. It begins with a short biography of Charles Hamilton Smith and then provides an overview of the British Army of the Napoleonic Era – not just the troops under Wellington, but all branches and regiments including the foreign regiments, the militia, and the East Indian Army. 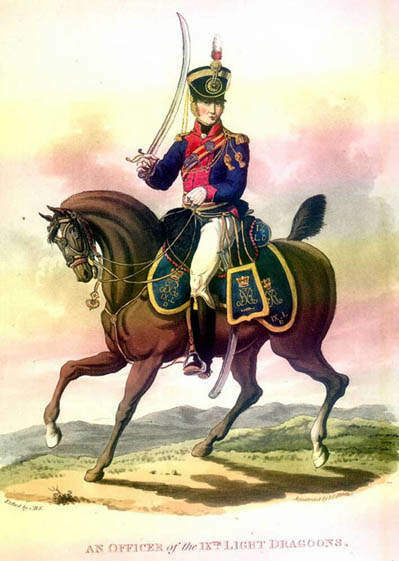 In 1812, the British Army received new uniforms, many of which were totally different than what was worn until then. Mr. Haythornthwaite devotes a chapter to why these changes were made and how the soldier in the field re-acted to them. He also supplies some answers on when the soldiers on active service received these new uniforms. These plates represent what the soldiers were authorized to wear by the new regulations and not what they actually wore. At the time he painted them, Hamilton Smith was stationed in London and many of the regiments were serving abroad. Hence he used local troops and according to his notes, “the pattern uniforms at the Board of Clothing.” Much to the credit of the publisher, the plates in Wellington’s Army are based on the original drawings rather than ones that were re-issued at a later date. Although most of the plates contain no surprises, several of them show uniform items that never made it to the field or were quickly withdrawn before they came into universal use. These include the dragoon helmet with a worsted caterpillar crest, bearskins for the guard grenadier companies, and guard shakos with brass trim around the rims. Although the plates are now grouped by type of unit, they were first published in groups of four, without any apparent rhyme or reason. Fortunately the editor of Wellington’s Army has placed the date they were originally published underneath each title. At the end of the cavalry, the infantry, and foreign regiments and militia sections are schematic plates showing the different facing colors and lace patterns for each regiment. Hamilton Smith even includes the colors for the three provisional militia battalions that volunteered for service with Wellington in the latter stages of the Peninsular War. Each plate is accompanied by an extensive text about the uniform plate. Mr. Haythornthwaite does a great job explaining what the reader is actually seeing – the uniform details and how they differed from what was actually issued or worn in the field. Liberally dispersed throughout the text are quotes from the soldiers who had to wear them. He closes with two appendices; the first lists all the regiments in the British Army in 1814–15 in the order of their seniority and their regimental commanders. The second gives the militia regiments in order of seniority and their full names. Wellington’s Army is a superb book! The publisher has done a terrific job reproducing the plates and the colors are rich and vibrant. Mr. Haythornthwaite’s supplementary text makes an excellent read and adds much background information. Do not put off buying this book. It is a steal at the price and will quickly become a collector’s item! This book is a steal at the price and will quickly become a collector’s item.